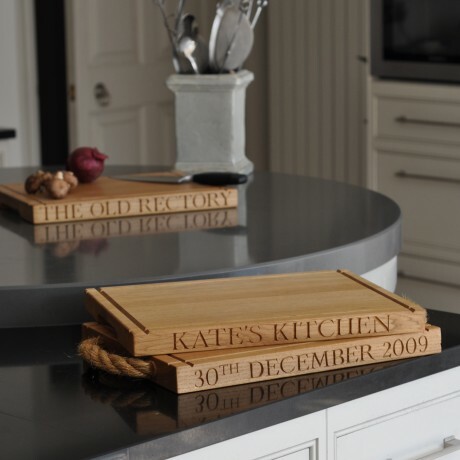 The Oak and Rope Rectangular Cheese, Chopping or Bread board makes a beautiful centrepiece for your table - it will be a talking point and subject to much admiration. The boards are made using traditional methods, showing off the natural beauty of the wood. Choose between rope handles or groove handles on the sides. Can be personalised with the wording of your choice. Often names and special dates for weddings, anniversaries and special birthdays. Also looks great with cheese names, house names or family mottos. Each letter is hand carved. What about WELL MATURED or THE BIG CHEESE for a big birthday? The perfect present for the top chef in your life. Try MARK'S CHOPPER... Up to 16 letters and spaces on each side. Hand-carved, exquisite oak pieces from a small corner of Kent.